Microsoft loves Linux, especially Ubuntu. Now, you can run Linux commands on Windows. This isn’t an April fool joke guys, it’s absolutely true. Microsoft and Canonical joints hands together to bring Ubuntu to Windows 10. It’s one of the trending, hot topic on the Internet right now. Microsoft and Canonical have revealed that Ubuntu user space and Bash shell are running natively in Windows 10 command line. Microsoft developers bring Ubuntu binaries natively in Windows 10, and they calls it their “Windows Subsystem for Linux”. Please note that It is not open source at present. Confused? Well, Let me explain. Now, we can open Windows command prompt, switch to Bash shell by typing “bash” in the Windows command prompt, and then run Linux commands such as apt, ssh, rsync, find, grep, awk, sed, sort, xargs, md5sum, gpg, curl, wget, apache, mysql, python, perl, ruby, php, gcc, tar, vim, emacs, diff, patch, and more. You can even check the running Ubuntu version too. As you see in the above screenshot, the current running version is Ubuntu 14.04.4 LTS. The developers are working hard to add the upcoming LTS release Ubuntu 16.04. “Right, so just Ubuntu running in a virtual machine?” Nope! This isn’t a virtual machine at all. There’s no Linux kernel booting in a VM under a hypervisor. It’s just the Ubuntu user space. “Ah, okay, so this is Ubuntu in a container then?” Nope! This isn’t a container either. It’s native Ubuntu binaries running directly in Windows. “Hum, well it’s like cygwin perhaps?” Nope! Cygwin includes open source utilities are recompiled from source to run natively in Windows. Here, we’re talking about bit-for-bit, checksum-for-checksum Ubuntu ELF binaries running directly in Windows. What about my personal files and folders? You can have access them too. All of your Windows drives, like C: are mounted read/write directly under /mnt. And, vice versa, you can see all of your Ubuntu filesystem from Windows Explorer itself in C:\Users\your_username\AppData\Local\Lxss\rootfs\. What more you want? Want to SSH to some other Linux systems? You can do it easily from the Ubuntu shell itself. 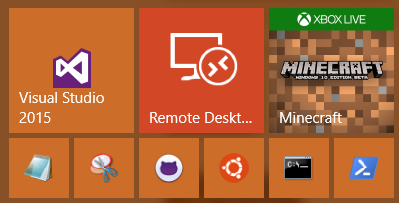 And, here it is how Ubuntu icon looks like on Windows start menu. Here is the complete video demo of Ubuntu on Windows by the Microsoft developers Rich Turner, and Russ Alexander. It sounds like Microsoft and Canonical will take the Linux and Windows Ecosystem in a new way. It is really a wonderful initiative by Microsoft. Let us wait and see how far it goes. WSL is intended for developer’s purposes only. No GUI apps can be started. Only console apps are running. WSL doesn’t content a real Linux kernel, it operates over Windows kernel with fork realization especcially for it.